This is it. 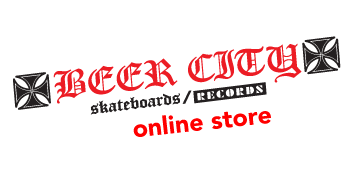 The first three Beer City skate video's on one DVD. 'Annihilation' is blood, guts, spirit and hitting the streets, pools and bowls. Hitting them, and hitting them hard. Riding hard, riding fast, getting in and grinding, not coming up for air, sticking with it until the end, putting your body on the line and praying that maybe, just maybe you can make through the session intact. 'Annihilation' is skating at it's purest, taking everything back to basics and having a blast. Featuring a multitude of riders who have consigned their souls to four wheels and a board, including Tim Kulas ,Dan Nepscha, Stuart Dodge , and more. Plus a guest appearance by pro skater and Beer Nutz hardware team rider Kristian Svitak. 'Annihilation' does exactly what it's name suggests. 'Wasted' ensures that the good times just keep on rolling, and picks up the pace with Duane Peters, Scott Smiley ,Tim Kulas , and the boys having fun on four wheels, ripping it up with some sick and way out there pool and bowl action and entertaining themselves with video camera's and also includes exclusive footage from the team's tour of Australia! 'Tanked'is the skate equivalent of an old school circle pit. Beauty in chaos, and transcendence through mayhem, nothing is scared as ramps, pools and the streets are utilized to their maximum potential by ,Scott Smiley ,Davey Rogers , Chris Benge and the one and only Master Of Disaster himself, Duane Peters accompanied by the usual crew of assorted reprobates. Doing what they do best to a thumping punk rock soundtrack.